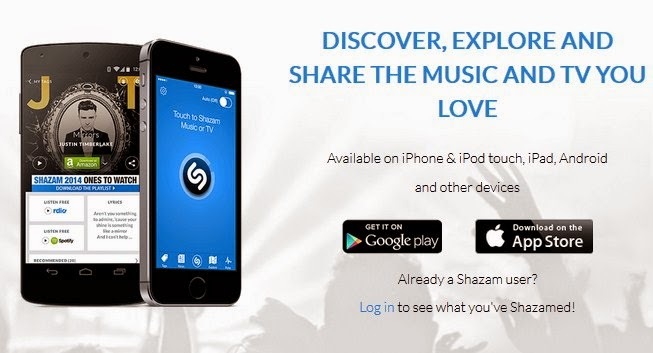 If you have always wanted to get quick and detailed information about a song you just bump into on radio, TV or a public space and asking from people around hasn't been too productive then, Shazam is your best option. Shazam mobile application is an application that listens to any song for few seconds then provides you with the details of the song such as Name of artist, album and so on, plus you also get an option to download the song if you wish (song download is not for free though but at least you can proceed to your usual mp3 or videos download site with the provided details of the unknown song to get it on your device). How To use the Shazam application to get details of unknown songs? To get details of unknown songs using the Shazam application, all you have to do is Download the shazam application, And after successful installation, launch the application then hold down the Tag button on the screen - - you should see a notification telling you that the application is now listening to the song, all you have to do is to just chill for few seconds to see the result containing the details of the song. And What If Shazam couldn't find the details? Actually, this occurs in rare cases but since it is meant to happen once in a while, I'd advice you first of all check your internet connection -if it's working, then it's possible the song has escaped the database and in the same vein, i suggest you visit this thread to notify the Admins. I have used the Shazam application to get details of songs I overheard in both noisy and cool conditions and i have always been getting results so i guess noise should not be a barrier, although that may depend on the type of phone you are using. Shazam: So, How Does it Work? This is exactly the first question that came to my mind the first day i came across an article like this one you are reading now, talking about the shazam mobile application. The shazam application has an online database with millions of audio finger prints and since every song has an entirely different audio finger print, this application just carry out the result by simply matching the audio finger print of that unknown song you are listening to with the corresponding fingerprint in it's database, then you get the full details of that unknown song after successful matching of its audio fingerprint with the correct one in the database. This application has been like a life saver since i discovered it on a friend's site -Wasconet some few weeks back and believe me, getting the name and Artist name of a song hasn't been easier since i started using Shazam. You may want to give it a try as well and I'm sure you'll soon be back to thank me later. Below are the download links for Shazam on Nokia, iOS, Blackberry and Android devices. We would like to hear from you, kindly use the share buttons below to share your experience or how this post has been helpful. Your friends may be interested in this post as well -share it with them via the social buttons below this post. I hope this application will live to expectation, there are so many apps out there that just don't deliver.